Some of you may remember when I made a Christmas card featuring this little truck and then a Valentine free-standing truck similar to this one. Well, I had to do it again! I was inspired by the patterned paper by Carta Bella called "Hello Fall." My card is a standard 4-1/4 x 5-1/2 inch card, top folding, with a black card base. The Cherry Cobbler layer is cut at 4 x 5-1/4 inches and embossed with a fall leaf embossing folder by Darice. I cut a piece of the truck patterned paper at 2-1/2 x 4 inches and then cut a black mat slightly larger. The truck is from the Cricut Everyday Paper Dolls Cartridge, on p. 71, cut at 1-3/4 inches in real dial size. The truck is a safari truck and is a little too long, so I cut the truck bed away from the truck behind the cab and trimmed off a small sliver. I inked all the edges of the two pieces in Cherry Cobbler ink and then reattached the two pieces together, overlapping the cab a bit onto the truck bed. I added 1/2 inch black circles for the tires and a 1/4 inch white circle for the wheel center, adding a small dot of ink to the centers. For the fenders, I cut a 1 inch circle in half, inked the edges, and attached them over the wheels, aligning with the bottom of the truck. I used a black marker to add a small black handle. I attached the truck to the card using dimensionals and then layered my pumpkins behind the truck bed. 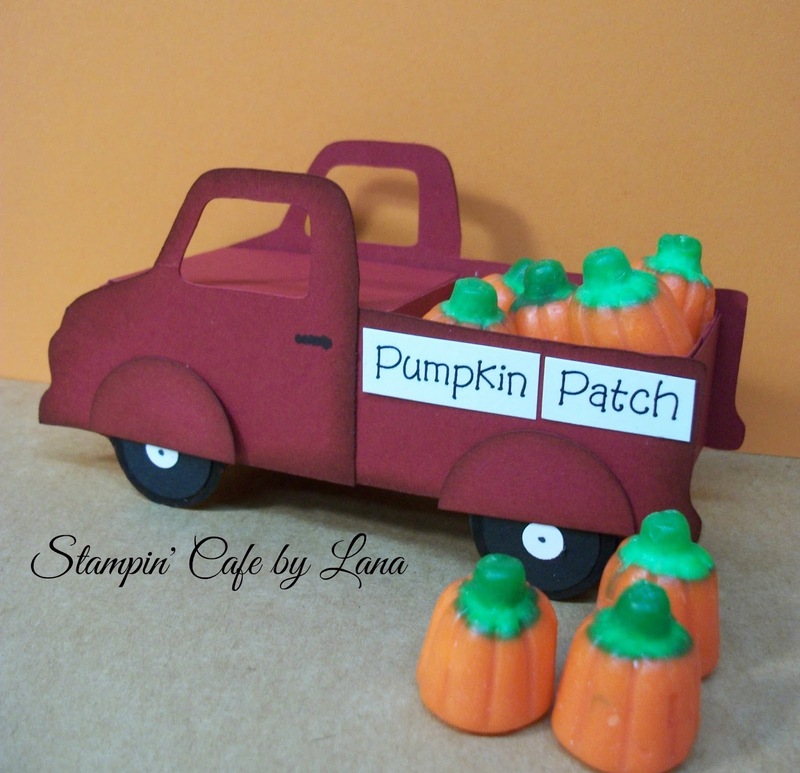 I used the Cricut Create a Critter Cartridge, p. 70, on shadow setting, to cut the pumpkins, ranging in size from 1/2 to 1 inch, and inked the edges, coloring the stems with a brown marker. I didn't have a "Happy Fall" or "Pumpkin Patch" stamp, so I created these on my computer in Word. I used the BaaBookHmk font. 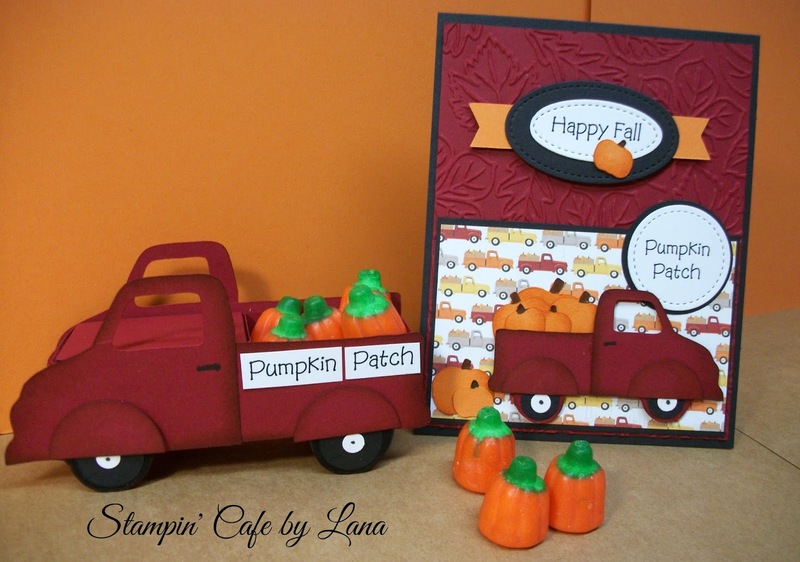 The greetings are both die cut using the Stitched Framelits by Stampin' Up and layered onto the card. 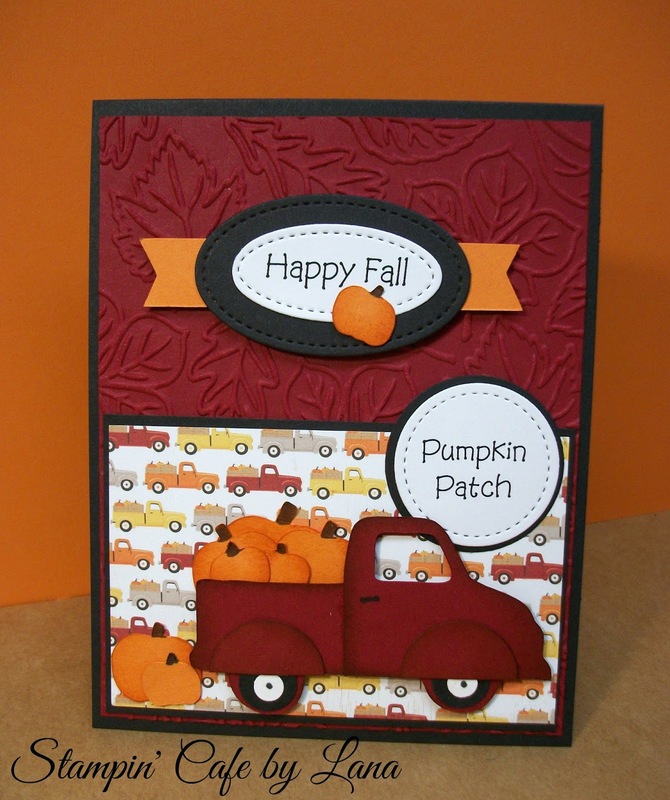 I added a hand cut banner behind the "Hello Fall" stitched shapes. The directions for the truck can be found in my previous Valentine truck post. (See the link below.) It measures 1-1/2 inches wide and approximately 4-3/4 inches long. I didn't add all the extras like I did on the Valentine truck, I just kept it simple. I added some little marshmallow creme pumpkins (one of my fall favorites!) to the truck bed. As long as you use a heavyweight cardstock, it will hold the pumpkins okay. Just don't put in too many. I also added the "Pumpkin Patch" words printed from my computer and cut them out. I hope you enjoy both of these first fall projects! I will have more to come in the following weeks. Fall is my absolute favorite season!